Chain of Memories – give or take a Re:, since I’m playing the PS2 remake version – is baffling in how it manage to be utterly inconsequential and desperately essential at the same time. For the majority of the game, you’re stuck revisiting almost all of the same Disney worlds from the original – RIP, Deep Jungle – though with stories that have been shortened even further and made to focus on memories as a key theme instead of heart. Adding to the sense of déjà vu in the PS2 version the reuse of all the assets from the first game, down to some of the exact same areas in cutscenes. The effect of all this familiarity is that most of your time playing Chain of Memories will be spent waiting for things to get going. When it does, though, that “desperately essential” quality pops up. The reason for Sora’s return to these old worlds is that he, Donald, and Goofy have entered a mysterious structure known as Castle Oblivion in their search for King Mickey. Upon arriving, their confronted by a cloaked figure and find their memories are slowly fading away. For the majority of the campaign, you only receive brief teases of the larger mystery, but by the end, the game has overwhelmed you with new concepts, including Organization XIII and their internal war, the memory-altering powers of Naminé, and the red-cloaked weirdo DiZ. And these aren’t just throwaway characters and creations for a handheld spin-off; Chain of Memories does a great deal of heavy-lifting to establish concepts that will be critical to the franchise’s future. In fact, Kingdom Hearts II simply hits the ground running, basically expecting you to know that it’s following a cliffhanger ending from a handheld game released on a completely different company’s system. 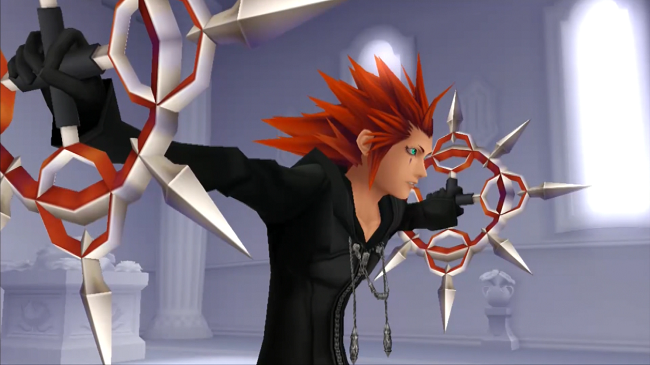 So, both in game and out, Chain of Memories was the starting point for how over-the-top and confusing Kingdom Hearts would get as it progressed. Ultimately, though, all of that would be fine if Chain of Memories stood apart and offered a fun, entertaining gameplay system. Fortunately, that’s exactly what we got, with Chain of Memories offering a challenging card-based strategy game that still captures the action elements of the original game. I legitimately loved the Game Boy Advance version of Chain of Memories back in 2004, and the PS2 remake manages to capture everything that made the battle system a joy. Admittedly, there does seem to be a bit more clunkiness to the full-3D version, but the fun is present in both versions. 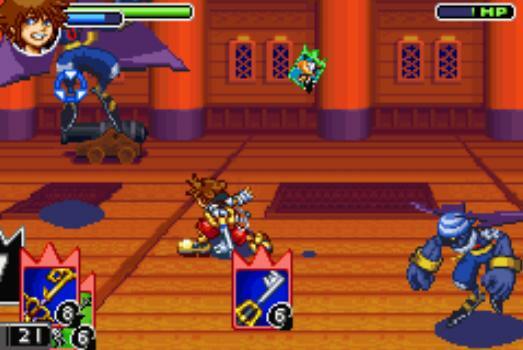 Instead of direct combat, everything in Chain of Memories, from Keyblade swings and magic spell to summons and recovery items, is represented by cards. What cards you use are determined by how you build your combat deck, allowing you to very specifically manage how you approach each fight. More powerful cards become available as you progress through the game, and leveling up allows you to build bigger, better decks. In addition to simply using cards in your deck, the game’s Sleight system allows you to stack three cards to trigger in one go. This can be used to trigger powerful combo moves if the right cards are combined, or simply to make sure three basic attacks can trigger properly. You see, in addition to simply using cards, you must consider their numeric power level of 0-9; higher number cards break lower ones, with 0 able to break and be broken easily. It’s a hard system to describe in words, to be honest, but it all makes sense once you spend a bit of time with it and start fighting enemies. It’s a lot of fun to build decks with your favorite cards, and many bosses will force you to rethink your strategies. Of course, both versions offer a number of easy-to-exploit Sleight maneuvers that make late-game fights a bit of a breeze, but that’s something that’s fortunately not an issue in Riku’s campaign. Yes, after completing Sora’s story, franchise bad boy Riku takes center stage in the “Reverse/Rebirth” story (a perfect Kingdom Hearts name). 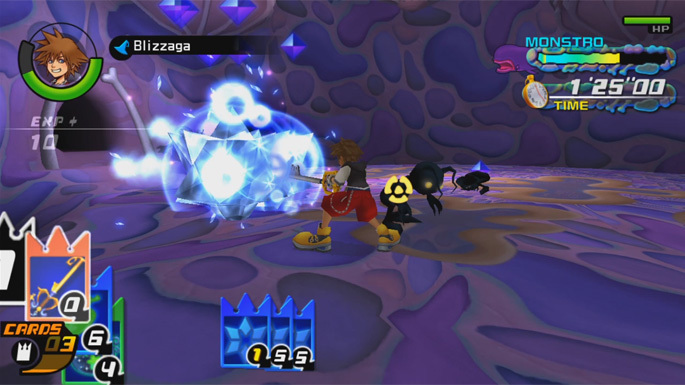 Here, we learn even more about Organization XIII and watch Riku struggle with the dark path he took in the first game. Though the Disney worlds are even more of a window dressing in this campaign, the story manages to be more engaging, giving us our first in-depth look at Sora’s best friend and his issues. Even better, Riku plays significantly different from Sora. He has a set deck for each floor made up almost exclusively of his Soul Eater weapon, allowing for even more tightly constructed boss fight challenges. He also can get into Duel standoffs with enemies and power up into Dark Mode for greater power and different Sleights. It makes for a great shift in gameplay to keep the shorter second playthrough from getting too tiring and, if anything, might’ve made for a great way to start the whole game, with the restrictive systems forcing you to grow even more familiar with the core gameplay mechanics. Overall, Chain of Memories is a unique, addictive entry in the Kingdom Hearts franchise, if not quite as original and fresh as the first game. I’d ultimately suggest going with the GBA version if you can track it down, given its gorgeous sprite-based graphics, but it works well in either format. The biggest problem is how repetitive the worlds are immediately following the original, but it makes up for it with a great card-based battle system and a great look at the franchise’s deuteragonist Riku. The temptation with the PS4 collection might be to skip right into Kingdom Hearts II, but it’s worth visiting Castle Oblivion and building a few decks in this charming title. 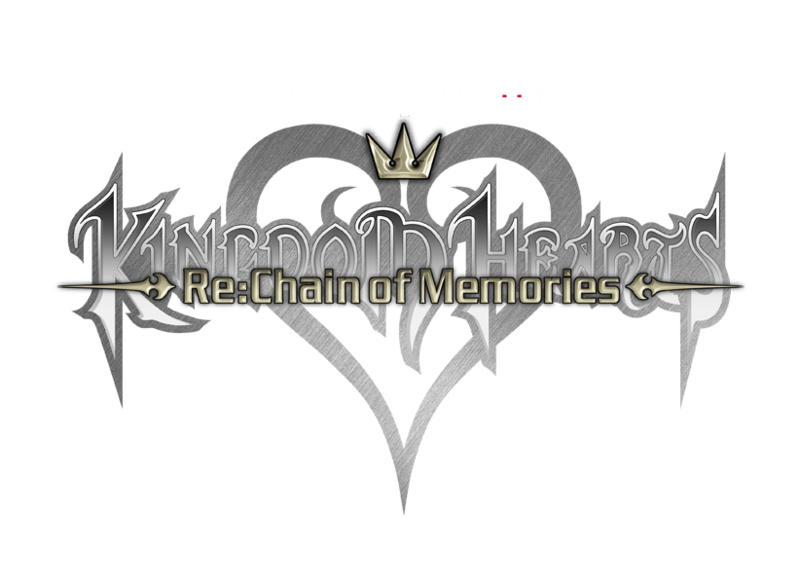 Tags: Chain of Memories, Disney, Features, Gaming, Kingdom Hearts, Kingdom Hearts: Chain of Memories, Re: Chain of Memories, Square Enix, Unlocked Reminiscence. Bookmark the permalink.